On July 8, 1963, Australian Prime Minister Sir Robert Menzies visited the White House for meetings with President Kennedy and for an official state luncheon. President Kennedy poses with Australian Prime Minister Sir Robert Menzies at the White House on 8 July 1963. 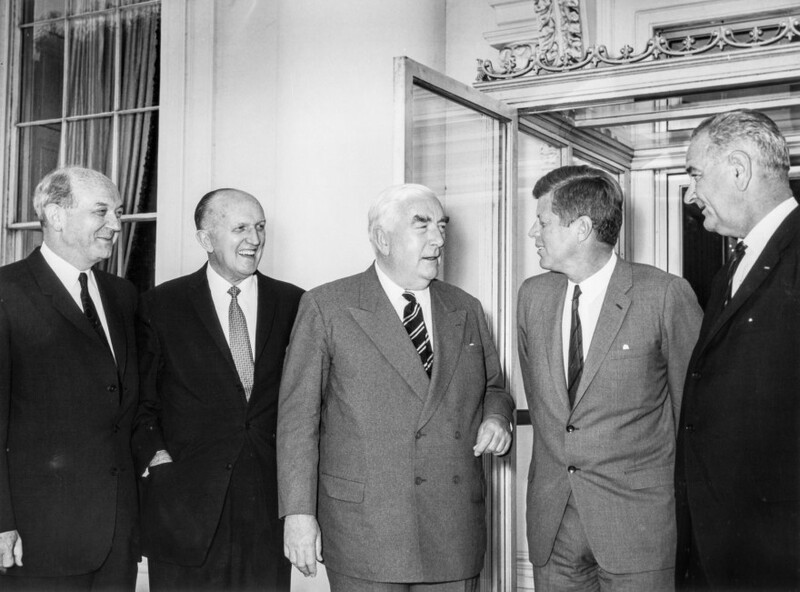 From left to right: Secretary of State Dean Rusk, Australian Ambassador to the United States Sir Howard Beale, Sir Robert Menzies, JFK, Vice President Lyndon Johnson. Photo by Abbie Rowe / National Archives. President Kennedy poses with Australian Prime Minister Sir Robert Menzies at the White House on 8 July 1963. 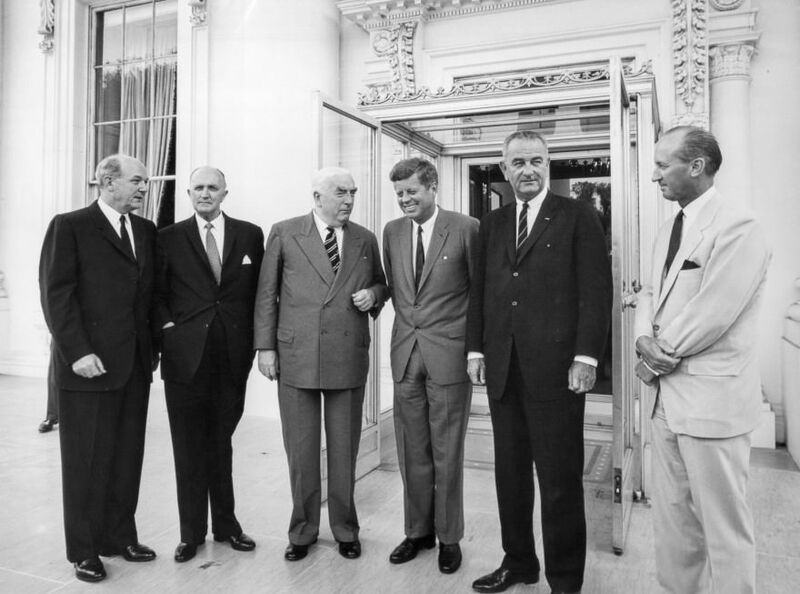 From left to right: Secretary of State Dean Rusk, Australian Ambassador to the United States Sir Howard Beale, Sir Robert Menzies, JFK, Vice President Lyndon Johnson, Unidentified. Photo by Abbie Rowe / National Archives. I know that all my fellow countrymen join me in expressing a warm welcome to the Prime Minister. I don’t think that there is any visitor that has more friends in the United States than the Prime Minister of Australia, and he has had those friends and kept them over a long period of time stretching back to the days of 1939. He has been a constant figure not only in his own country’s government, but also in the relations which exist between the United States and Australia. Those relations which permit the easiest kind of communication between the governments, which permit us to reach agreement on matters which in other countries might take much longer and might not be as nearly so satisfactorily resolved, have been a great source of encouragement to President Roosevelt, President Truman, President Eisenhower, and now to me. So, Prime Minister, we want to express our gratification that you came and visited us on your way back home. The Prime Minister was raising the clans of Scotland while I was doing the same in Ireland a few days ago with equal effectiveness. But we appreciate his coming here. We are glad, particularly, that he came to us after visiting the home of one of our most distinguished Presidents, President Jefferson. I think the relationship between Australia and the United States is based not so much on sentiment and not only on self-interest–although there are, of course, those factors–but I think our confidence in Australia was built during two world wars, most particularly in the days of World War II and in the days that have followed when the United States and Australia have moved in such concert together. I hope that our reputation in Australia has been maintained since World War II as a determined friend and also in Mr. Jefferson’s words as a “bold enemy.” I think that the days ahead for us both are going to be particularly critical. I am glad to have a chance to remind the American people, as well as the Government, that we should look not only east towards Europe but also west, towards the not always Pacific Ocean, and particularly look west towards our friends in Australia. We are glad to have you here, Prime Minister-and members of your family–and I hope that you will all join with me in drinking to Her Majesty, the Queen.